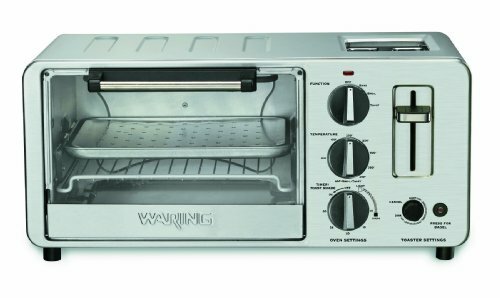 The Waring WTO150 4-Slice Toaster Oven with Built-In 2-Slice Toaster is one product with enhanced efficiency combining a second oven, a simple toaster, both of which can be used simultaneously. This means that you can use it for baking, broiling and toasting at a go. The oven is large enough (0.45 cubic ft) to toast or bake foods while the built-in 2-slice toaster can be used for toasting extra bread, bagel or any other food. This toaster has a reasonable price and is a popular product of Waring Pro, a fact reminiscent for its reliable performance. Dual Functionality – With built-in 2-slice toaster you can toast, bake and roast at the same time, and still use the separate toasting component to prepare bread. This feature has motivated many mums to buy it. Ample capacity – The oven is 0.45-cubic ft.
Adjustable temperature and easy access controls – With dials at the front used to adjust the thermostat. What Do Owners Say About The Waring WTO150? Space – The oven is compact but roomy enough inside. The design saves a lot of space because combining two 2 kitchen appliances frees up the much needed counter top space is rare. It weighs just 9 pounds. Clean Up – It is easy to clean because of the aluminized steel interior. All you need to do is simply use a soapy sponge or piece of cloth in wiping both the interior and exterior. Bagel Function – Toaster has a convenient cancel feature and a button to extend toasting for bagels. The bagel Cancel button offers the option of cancelling it at any time. Nonstick-free – For those who care about the material of the interior of the oven or surface of the bake pans, this model has no Teflon coating and its interior is aluminized steel, which means that you won’t smell poisonous gas when heated. While the toaster oven works very well, is simple to operate and generally fits the bill, it is not that perfect for some owners. Timer – It has a timer for setting the cooking time (up to 30 minutes) and automat switch off after the set time expires, which is a safety feature. Some owners said that you have to wait beside the oven to reset the timer to restart the oven if you want to cook food for more than 30 minutes. It’s a common issue with many toaster ovens. Toaster Slot – Some owners complain that it would pop up too early or too late when toasting. Snugly Oven Pan – It has to be slightly pulled out before removing it. Other owners said the pan can be used without the rack so there is no problem. Slow – Several users said it’s relatively slow and the handle may not stay down. From these features, you can see that the Waring Pro WTO150 is one unit that conveniently combines the oven and toasting functions. Plus the bagel feature brings with it the option of tasting great toasted bagels. But it’s nothing more than this.